I was having a pretty good morning. You know, I liked my outfit. I felt pretty pulled together. I even pre-planned my day and remembered to bring a lunch to work. I led my first meeting for a summer program, it went well and the team seemed excited. Then, I had a meeting with another staff member as we planned some future events. All was well in my world. “You’ve got this. You are rocking today.” I said to myself with confidence. Then, I went to the office kitchen to make a coffee. As I was chatting with a work friend, she looked down at my feet. All of a sudden I was actually the least pulled together person on the planet. Slightly consoled by the fact that none of the 10 people I had seen in my meetings had noticed. But still, completely mortified. WHO WEARS TWO DIFFERENT COLOURED SHOES TO WORK AND DOESN’T NOTICE UNTIL 11AM? I wish I could say this was the first time anything like this has happened to me, but honestly this is actually part of who I am. I’ve left town with all the keys (husbands love that), I’ve chased rolling cans of peanuts under cars in parking lots, I’ve tried to start cars that weren’t mine, I’ve lost bank cards into the dash of my car, put groceries in a stranger’s cart, walked into vaguely branded men’s bathrooms and in my most horrifying moment I almost went live on national television with the full leg size sticker running down the front of my new pixie pants. But it’s not all I am. I know I’ll be remembered for some of my Shelly-isms but I’m determined to make my legacy about more than mismatched shoes, inside out shirts and unfortunately placed leg stickers. We can’t control everything that happens to us, but we can control who we are in all our situations. Every reaction, every response, every word is all part of our legacy. We are creating legacy each and every day. 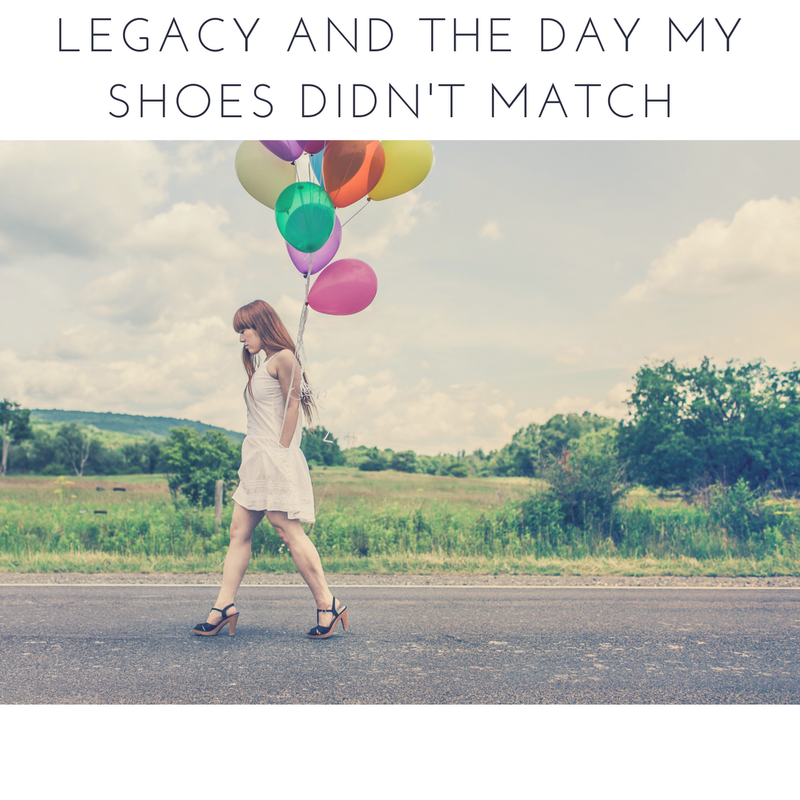 I used to think that legacy was something we just left behind, but more and more I think legacy is about the present. How we live our lives each day. One day we will all be remembered by those who loved us, and we can help shape that by intentionally living a legacy-filled life now. We can purposefully participate in what we want our legacy to look like. Everything we do, is our legacy. And while I want to leave a good one behind when I go, I want to intentionally live legacy life each day now. Legacy living is a choice. Let’s chose to let our life speak loud for who we are. Maybe you’ll have some mismatched shoes along the way. Or people staring at you running through a restaurant. We will always leave something behind, but we can choose who we want to be now. « 10 ways to show love, in a world filled with hate.